For the first ever Kentucky Green Living Fair on March 30, 2013, invented and pulled together in about three minutes by wonder woman Jamie Aramini of Sustainable Kentucky, I am giving a talk called "10 New Reasons to Love Ol' Sorghum." Here's the Powerpoint presentation. Oh, and I'll be selling and signing books. 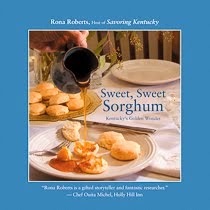 And I'll be sharing samples of Sorghum Caramels, from page 96 of the book. Sweetness!